Fri-Yay! We made it! I just want to quickly thank everyone for sending me such sweet and encouraging messages regarding our first Bliss List post in the series, I’m happy it’s being so well-received and I look forward to sharing it with you every Friday. This week has seemed particularly long – the weather here remains unpredictable and grey, the kids’ have lingering colds and sniffles, and we’re all craving warm sunshine while we count down the sleeps until our family getaway! Fortunately, I’ve had something to look forward to this weekend – our Yves Rocher meet and greet is this Sunday! If you’re local (or you’re up for a road trip), you can find details on our Facebook page and my latest Instagram post. I can’t wait to see you there! There are many mornings that I wake up at the same time as Ella and Noah, but recently I’ve been trying to be diligent about creating my own morning routine that begins before they’re out of bed. I find the mornings that start with a hot cup of coffee and breakfast prepared before the school-day rush, are the mornings that are easier on all of us (and that can include spontaneous kitchen dance parties). 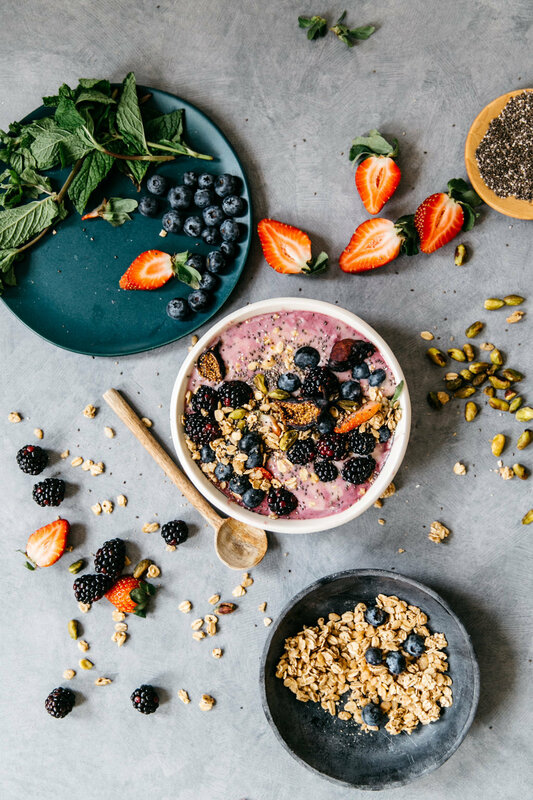 These smoothie bowls are not only beautiful but they’re just the thing to encourage me out from under the covers when all I want to do is hit snooze. Bonus: the kids can each “decorate” their own bowls with healthy toppings like chia seeds, flax seeds, nuts, and berries. Has anyone binged on HBO’s Big Little Lies?! A girlfriend of mine is obsessed with it and told me it’s a must-watch. Based on the book also titled Big Little Lies, the series boasts an A-list cast starring Reese Witherspoon, Nicole Kidman, Laura Dern, and Shailene Woodley; not to mention Meryl Streep has begun filming with them for season two. The women of Monterey, California (where the drama is set) cleaned up during awards season snagging multiple Emmys and Golden Globes – including the Golden Globe for Best Miniseries. I’m going to give it a try the next time I’m in the mood to log some serious couch time. Wine included. I don’t burn a lot of candles but Anthropologie’s Volcano is definitely a favourite! It’s juicy and fresh and is the perfect scent for spring and summer; I’ve been burning it for small bursts in the evening, yearning for the warmer temperatures soon to come. And if you’re looking for a pretty pop of colour, they’ve released this style for spring. With its cult-like following, its always one of the first items I add to my cart whenever Anthro is having a sale! Until this grey and dreary weather passes, I’ve been looking for ways to make our home feel extra cozy when Craig and the kids come home. There’s definitely nothing quite like the smell of a warm cinnamon bun, freshly baked from the oven, to welcome you home after a long day. 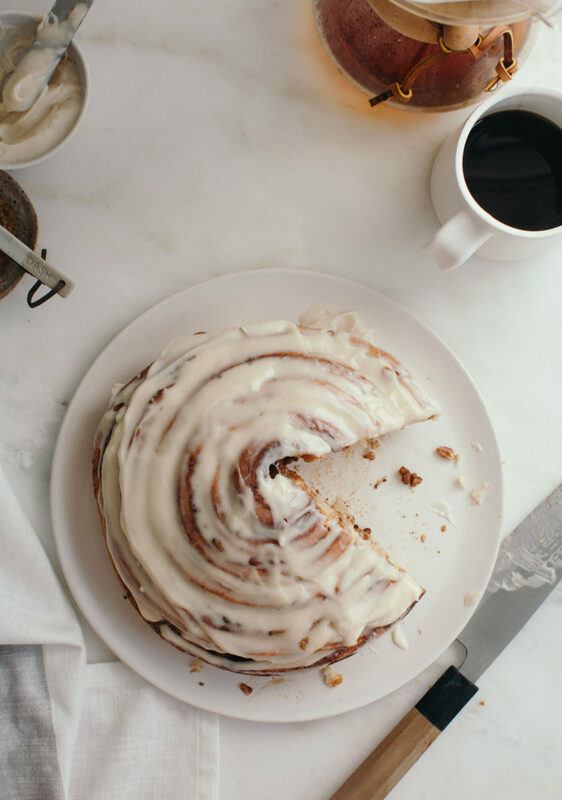 This massive cinnamon bun recipe from A Cozy Kitchen is the perfect indulgent mid-week treat! I haven’t begun packing for our family Cuba trip just yet (because I’m sure it will be completely stress-free to do it a few hours before we’re supposed to leave – ha!) but I have begun online shopping! 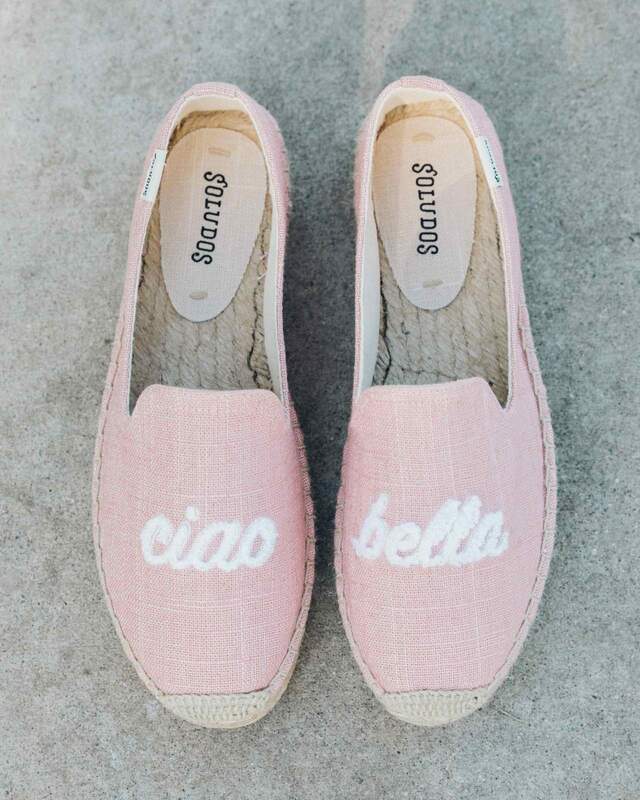 These ciao bella Soludos espadrilles just arrived, how darling right? They’re the prettiest shade of dusty pink and are seriously oh so comfortable. I know I’ll live in them while we’re away, heading from the beach to a restaurant without skipping a beat. And for those of you who still ask about my mimosa Soludos espadrilles from last summer, you can find them here. 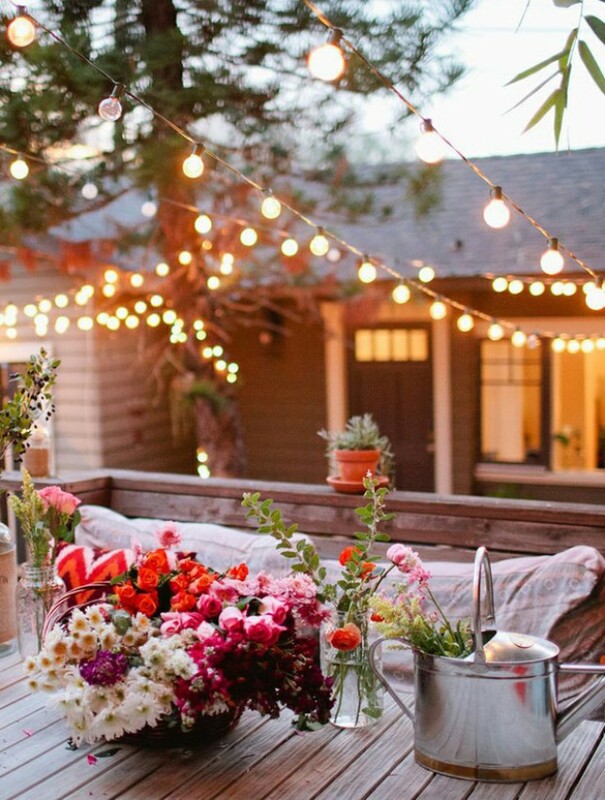 I found this image on Pinterest and I can’t stop swooning over it – it’s definitely backyard entertaining goals! The glowy ambiance, the romantic string lights, the eclectic mix of florals and greens, and the cozy seating are just perfection. I’m not sure how much longer I can (not-so) patiently wait for the warmer weather to arrive but I am definitely feeling inspired! If you’re looking for al-fresco backyard inspiration, be sure to follow me on Pinterest for more dreamy sources. 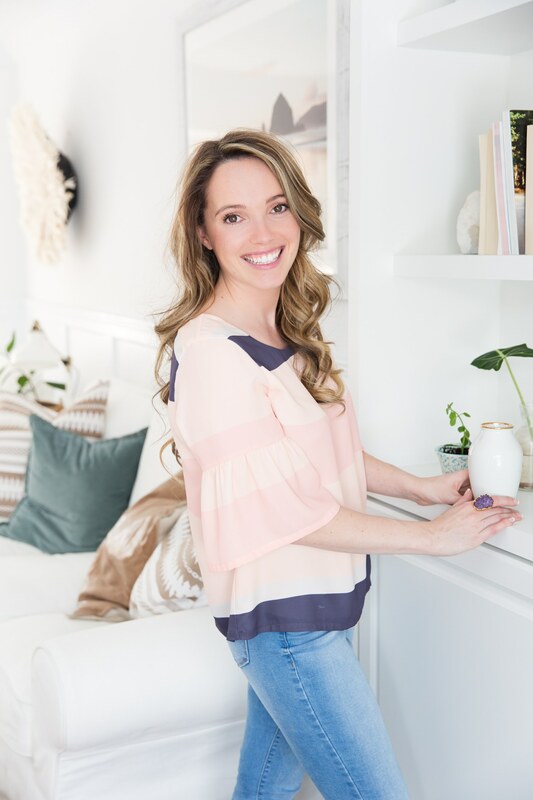 As always, I can’t wait to hear your thoughts on this week’s Bliss List – do you have a morning routine in place or do you prefer to linger and lounge in bed? I’d love to know if you’re hooked on Big Little Lies (no spoilers!!) or if you have any other binge-worthy tv recommendations. And I definitely want to know how you keep your mood bright when the weather is seriously a bummer.